This one is hardbook and the first one in the Harry Potter series. It was translated by Peter Needham. 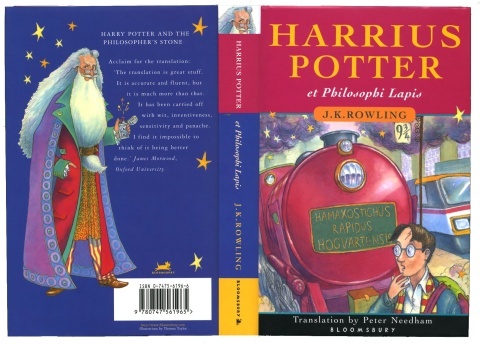 Interstingly it's the only book to actually change the main characters name, Harry Potter is called "Harrius Potter". It's wildly believed that the Romans invented the train, as proven by the "Hamaxostichus Rapidus Hogvartensis" on the front cover. This book was actually very popular both amongst citizens and slaves across the Roman Empire back in 137 AD - very unusal given that most people did not know how to read, but the book none the less sold maybe as many as five. Harrius Potter et Philosophi Lapis, translated by Peter Needham.